I can’t believe little Miss Eva is already 1/2 year! 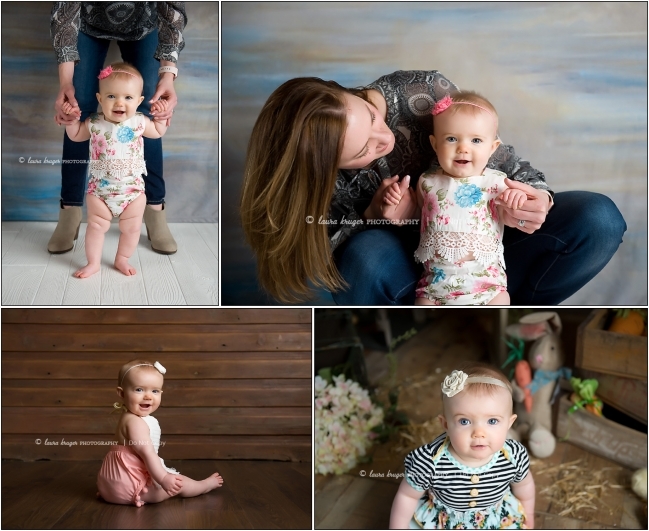 She was so smiley and happy at her 6 month session! I always love when Ashley brings both girls! Big Sister Mila was all about being my helper! She got the most genuine smiles out of her little sister!! I also love when Mama is willing to pop in a photo or two! Just look at Eva’s thighs!! I LOVE squishy babies!! They are so adorable!! If you are in the Pike County, Illinois area you need to hit up Mimi’s Boutique! Ashley and her mother in law, Jonie have a small selection of spring/summer special occasion dresses and casual wear for your little ones! Stop in at Ina’s Westside Salon in Pittsfield to check it out. Both outfits (in exception of the lower right) are just two of the cute outfits they have! !